BING: My iPhone binged in the night to let me know an email I was waiting for had just arrived. 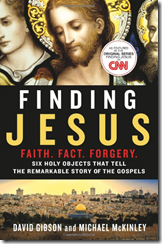 Amazon was letting me know that the book I had pre-ordered, Finding Jesus: Faith. Fact. Forgery. : Six Holy Objects That Tell the Remarkable Story of the Gospels, had arrived on 1) my laptop, 2) my iPhone and 3) my Kindle reader at 12:13 am on the very day the book was released. This is the book that is a companion to the upcoming CNN special. After 3 cups of way-too-early-in-the-morning strong coffee, I’m happy with what I read. It dovetails nicely, though not in every detail, with what I think is true about the shroud. ANOTHER BING: Another email. The audio version just arrived from Audible.com at 4:33 am. Perfect. I have a dental appointment later this morning and so I’ll put some ear buds in my ears and start listening to the book from the beginning. * BTW: If you haven’t ordered John Klotz’ The Coming of the Quantum Christ: The Shroud of Turin and the Apocalypse of Selfishness, do that while ordering Finding Jesus. It will only set you back another ten bucks. John will thank you and you will thank me for recommending it. Hello Dan, may I ask you something about that book?